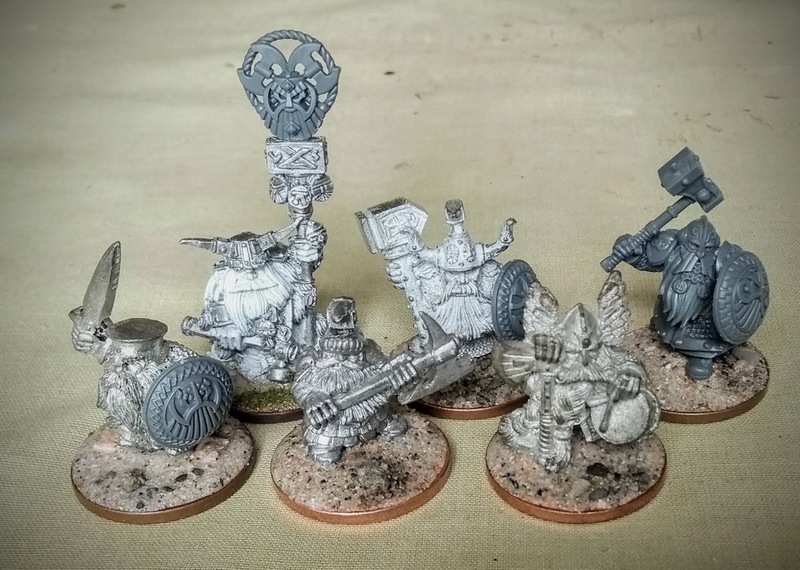 As I mentioned in my previous post, the dwarfs are back. Here are the first half of a planned unit of twelve. I seem to have taken so long to get together this small bunch, it's been two years since I started work on them, though only the one plastic warrior at the rear survives from that first attempt. I know a lot of people like the cartoonish, gnome-like figures of old. I do myself, in some cases. But I have always felt that basic dwarf infantry have been a bit, ahem, short changed. The fluff and artwork have always described them as hardy, well armed, doughty fighting warriors, but the models have always portrayed them more as bumbling oafs. I want my warriors to look battle-hardened, experienced and a bit grim. These are a varied collection of many different generations of the dwarf. Front left and front centre are both Marauder dwarf figures from 1992 I believe. The centre figure had a strange pom-pom on his helmet, which I cut away and replaced with the banner top from the figure rear left, which then had a plastic bit from the current hammerers set. This will be the banner bearer of the unit, though originally it was a runesmith from around 2005 I would guess. The rear central figure is an old Anvil bodyguard, again from around 1992. And the drummer is a longbeard from the mid to late 1990's. So this one unit contains bits spreading over 25 years, which I find particularly fitting as it matches my time in the hobby. It's been a long road to get here, but I finally feel happy with my initial selection. The second half of the unit will no doubt cause more headaches, but I can cross that bridge some other time. For now, I can get on with happy task of painting. 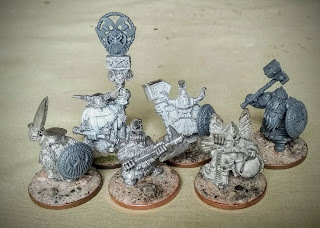 I look forward to seeing these painted!